Glowbal Restaurant Group has officially launched Nosh, a one-of-a-kind grab n’ go eatery and pâtisserie in downtown Vancouver’s newest architectural landmark, TELUS Garden. Transitioning from a bakery in the morning, to a salad and panini bar complete with fresh pastas in the afternoon, to a destination for cocktails and late night bites in the evening, Nosh is the place that locals and visitors alike will want to keep discovering again and again. The irresistible dessert showcase takes the place of honour at Nosh, with offerings including artisanal pastries, macarons, truffles and other handcrafted creations by acclaimed pastry chef Elie Nehme. Additional daily options suited to those on-the-go include customized salads made to order, fresh pastas, small plates and the daily roast sandwich, plus a European-style cocktail hour every weekday from 2:30 p.m. to 5:30 p.m., featuring complimentary tapas with each beverage ordered from the $6 cocktail hour drink menu. For busy professionals, Nosh offers office lunch packages at $10 per person, including customizable housemade sandwiches, salads and wraps, with a soon-to-launch online ordering system allowing for quick and easy meal pick-up from self-serve shelves. Fresh and modern, the 1,600 square-foot open concept room spills organically into the TELUS Garden lobby with a loose border of spun metal pendant lights, offering a welcoming entry point to the building. The design balances warm walnut millwork with the contemporary appeal of glossy black marble cladding, and includes fully retractable glass doors that open onto a modern patio. From a glass tile ceiling that glows at night with alternating coloured lights, to comfortable tableside and sofa seating, plus a fire table to ward off evening chills, the patio adds a cozy touch to TELUS Garden’s array of of advanced amenities. 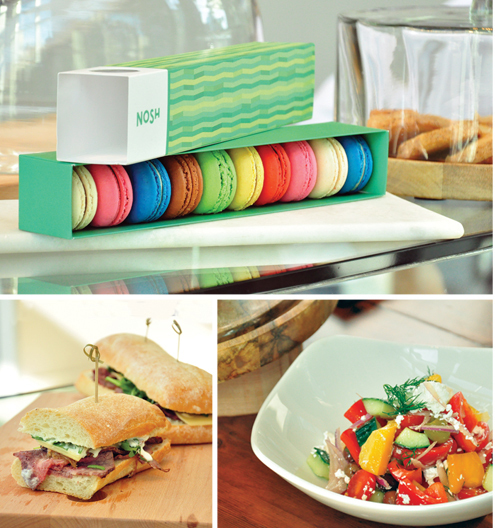 Discover Nosh at #101-510 West Georgia Street. Open from 7:30 a.m. until late, Monday to Friday, and 10:00 a.m. until late Saturday and Sunday (August 2015 onwards only), Nosh can be contacted by phone 604-449-NOSH (6674), email [email protected], or website www.nosh-cafe.com.